Every Tuesday morning, other than around the Winter Solstice and between Memorial and Labor Day, there’s a Coffee Hour for Dickeyvillains. As we near the summer and the end of coffee until next fall, and as I face the bittersweet prospect of going back to work after having free on Tuesday mornings for several months, I have been thinking a lot about how much this event has done to make me feel at home here in Dickeyville. Coffee happens in the Undercroft of Dickey Memorial Presbyterian Church. It’s a beautiful space, with high ceilings, lots of windows, and pale yellow walls, with an area essentially set up as an over-sized parlor. Usually Mel, our current Community Association president and a true philosopher king (in other words, we made him do it), opens up the space and around twenty-five neighbors filter through over the course of the event each week to catch up with each other. I started going to Coffee with my friend and neighbor who I got to know last year when both of us were feeling lousy. I was pregnant and had hyperemesis, and she was going through chemo – which gave us some common symptoms that magically transformed us into both each other’s cheering sections and great friends. She encouraged me to overcome how awful I was feeling (not to mention my own introversion) to get out and spend some time in good company, and after a couple weeks of resisting, I did. That was really more the beginning of my being a part of this neighborhood, in many ways, than moving here was. I’ve heard others say the same – especially a few other mothers who went to coffee when they were home briefly with their little ones. Since that first time in attendence, I’ve returned regularly, and gotten to know the neighbor who appointed himself the one-person ad-hoc Village Birding Committee at the last Community Association meeting (without breaking with Robert’s Rules). He and other neighbors came up with the idea for what turned into the winning entry into the Dickeyville Flag Design Contest – based on a quilt that was made here decades ago. I felt really guilty a couple months ago because, no sooner than he was out of earshot, I saw a bald eagle he’d been looking for in the woods. I befriended the aforementioned philosopher king, also a mathematician, who understands that if my son ever develops the all-too-common distaste for math, he’s in line to make it magical again. He knows everyone and walks everywhere and has a sense of humor similar enough to mine to make him great fun to talk with. I’ve gotten to know a neighbor who knits with much more dedication than I do, who’s told me amazing stories about being a civil rights activity when the movement was first in full swing. She liked my scarf once over the winter, so when she was away for a bit due to medical stuff, I got her one like it to welcome her back, which led to a wonderful conversation about an only slightly goofy mutual love of paisley. I met a neighbor who moved here in part to be able to continue her love of teaching people about history through the Maryland Historical Society. She’s got a garden plan charted out on graph paper, and, last I heard, was pretty much done with initial implementation and waiting to see how it’d turn out. She invited me spontaneously to a lecture of the Maryland Horticultural Society a month or so ago, and it was one of my first times out that had nothing to do with my son since he was born. My friend who initially encouraged me to try the event is now my son’s godmother, and I’m heading over to pick up some Jack-in-the-Pulpit plants from her later. She just reached the end of her chemo-surgery-radiation trifecta, and actually has a break now — so she’s working on her garden and long-planned renovations to her beautiful old house. I’ve learned to create a welcoming space for a neighbor whose husband’s passing left her lonely and a little bit fragile, and to make sure that I always listen to her stories, even if I’ve heard them before. She gave my husband a homework assignment to give me three kisses yesterday, and insists that she should teach my son how to read. That’s all the anecdotes I’ll go into, but it’s far from the end of what could be said. I’ve met actors and artists and scientists, a doctor, a mariner, and an interpreter, people from all over the world — all at this unassuming little neighborhood get together. 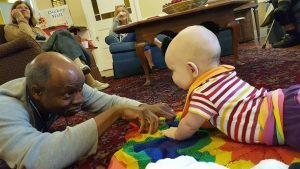 I’ve learned that my son really likes playing with other babies, and that no two babies are alike (which everyone knows, but you know it better when you see it). I’ve re-learned how to make coffee, which I haven’t drunk myself in years, for that matter. If I can, in the fall, I’m going to try to be home some Tuesdays so that I can continue to go to Coffee. I’m incredibly grateful to this tradition for weaving a thread of community into my life unlike anything I’d ever experienced before or thought I’d experience. It was there for me at tumultuous time in my life, and I’d be less without it. Regardless of what my own future holds, I’m glad that it’s here for my neighbors – my friends.